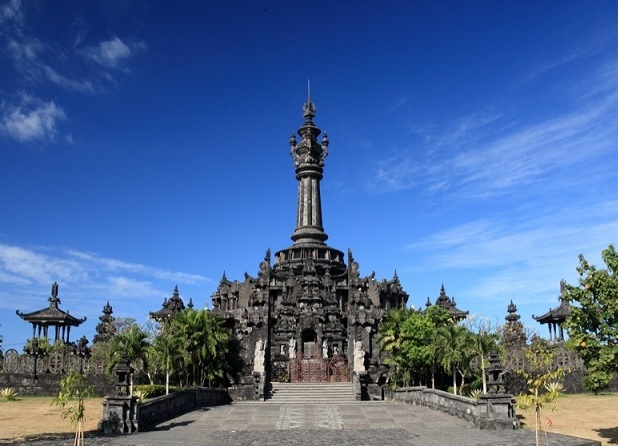 "Denpasar is the largest city in Bali and most attractions are located there. However, you�ll find small coastal towns with enchanting beaches all along the island. Many of these have become part of the larger Denpasar metropolitan area, but they still retain a distinctive local flavor." Denpasar in colonial times it was written as Den Pasar. It's the capital of the island since 1958, and the province of Bali, Indonesia. The city lies on the southern coast of the island and is divided into three Kecamatan (sub-districts): West Denpasar, Denpasar East and South Denpasar. Besides the government offices it's also the home of the business and tourist offices of Bali. 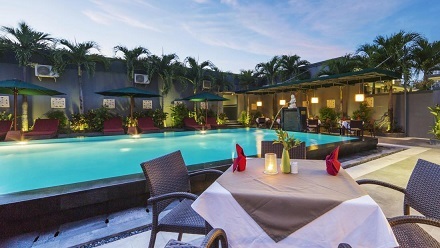 Denpasar is not the example of a tropical paradise, but it's the commercial heart of Bali and it's still worth a visit. It is located in Badung regency (county). The "mascot" of the city is the bunga Jempiring, a Gardenia species. Denpasar is a bustling town with many shops and markets, where you can buy the characteristic Batik fabric, including the special from Bali. There are several attractions in the city such as temples and ancient palaces. An example is the Pemecutan palace. You can go shopping at the Matahari Duta Plaza, Ramayana, the local markets or in one of the many gold shops in Denpasar. The white sandy beaches are at a considerable distance from the center of town. That's where most of the hotels are. The most famous surfing beaches are Kuta Beach, Legian Beach and Canggu Beach. During the conquest of Bali by the Dutch colonial army was the hardest fought here on the west side of the city on September 20, 1906. Around the palace (puri) of the prince of Badung with their servants took the poo utan (ritual suicide attack) of the Royal family place. They would not surrender to the Dutch authorities, but had no means of effective resistance. Armed with krisses (knifes) and dressed in white they walked on the bayonets of the army and no one survived this. In Banjra Sandhi Monument is commemorated. Inside the monument is an exhibition of photographs and a diorama. In 1928 the first real hotel in Bali was opened by KPM (Royal Society Package) in Denpasar called: Bali Hotel. The central landmark of Denpasar is Alun-alun Puputan, the green square that is in the heart of the city center. here a There;'s a huge stone statue of Catur Muka overlooking the traffic island. The Hindu watchman with four faces and eight arms towards points to the four compass points, and this statue indicates the exact location of the center. The Museum Negeri Propinsi Bali is a clear ethnographic museum with mostly English captions. In the various pavilions, mostly built in Balinese style, the museum includes a prehistoric collection, dancewear and masks, attributes benefit of the Balinese religion and a huge collection of diverse textiles. Badung Central Market on Jalan Gajah Mada is located south of downtown Denpasar. This market can be best to visit in the morning, but it's open until late evening. The activity at Pasar Badung (the market) is enormous. On the ground floor you will find fresh foods and dried foods. On the second floor you will find spices, while the third floor is devoted to crafts. 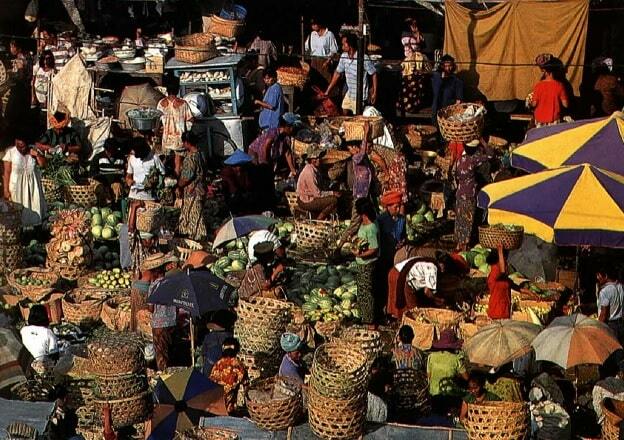 Everything what is grown and produced in Bali can be found here, often at bargain prices. 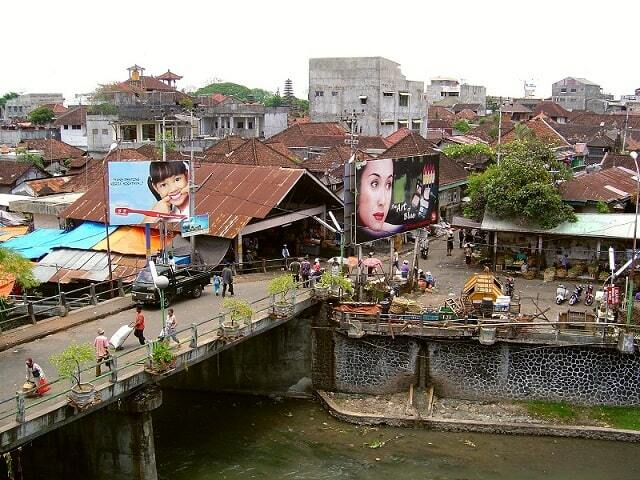 The other side of the river is called the market Kumba Sari. In this building with four floors, you will find both food and crafts, beautiful fabrics and decorated with gold costumes. The shops and stalls are richly decorated. You will soon forget, that you are shopping in a modern building. The Jagatnata Temple is the largest Hindu temple in the city, where many Hindus come to pray. Especially when it's full moon and new moon. This temple is full of religious and artistic ornaments. In the middle of the temple, there is a large temple building, surrounded by a fertile, tropical garden. From the entrance to the temple building are on the left and the right Balinese decorations. Denpasar is a melting pot of different cultures from all over Indonesia. The transmigration policy of the government is clearly seen in the various regional restaurants here. For that reason, it is a beautiful town to visit. Eating in specialized, regional restaurants you can enjoy various regional and ethnic Indonesian dishes. 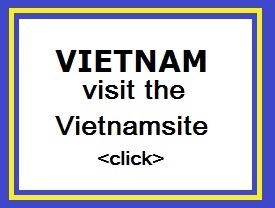 You can ask a taxi driver or the front desk, where a specific restaurant is located. The main bus station is Ubung Denpasar, which is also a station for bemos is. Buses leave from Ubung to Surabaya and the rest of Java, including the ferry between Banyuwangi and Gilimanuk, mineral water and a meal. The journey takes about 10 hours and the departure is at 19:00 pm. Near the town is the Ngurah Rai International Airport. It's about 13 km south of Denpasar. It is the third busiest international airport of Indonesia. The city has an area of ​​127.78 km � and its population is 600,000. Denpasar is the starting point of the Asian highway 2, an AH-road is more than 13,000 kilometres long and ends in Iran. There is also a bus station in Denpasar, from here leave many minibuses to other places on the island. Offering quality accommodations in the restaurants, shopping, and business district of Bali, The Banyumas Villa is a popular pick for both business and leisure travelers. The hotel lies two kilometers from the city center and provides accessibility to important town facilities. A well-kempt environment and its proximity to Consulate of Mexico, Consulate General of Timor-Leste, and Consulate of Australia give to this hotel a special charm. The Banyumas Villa also offers many facilities to enrich your stay in Bali. For the comfort and convenience of guests, the hotel offers a family room, safety deposit boxes, concierge, smoking area, and restaurant. Guests can choose from 22 rooms, all of which exude an atmosphere of total peace and harmony. The hotel's host of recreational offerings ensures you have plenty to do during your stay. The Banyumas Villa is your one-stop destination for quality hotel accommodations in Bali.